Nur Khatun Bibi, a 50-year-old mother of two daughters, belongs to Daribosh – a remote village in West Bengal’s Cooch Behar district. Nur and her husband worked for long hours to arrange a square meal for their family. Despite their poverty, Nur has always encouraged her daughters to continue their studies. Since her childhood, Nur has always been very energetic and hard working. Poverty and issues impacting the lives of women always disturbed her. She took an initiative to find solutions to issues of violence against women in her neighborhood. In late 1990s, she set up a women’s Self Help Group and took up issues like violence against women, human trafficking, and early marriage. They continued to work with the support from like-minded local women and youth. ActionAid India supported their work on combating trafficking and child marriage between 2005 and 2008 in 15 villages. During this period a women’s collective called Pramila Bahini was initiated. It was working on women’s rights focusing on issues like violence against women, human trafficking and early marriage. ActionAid India also extended their supported to them for a long term perspective to spread their work on women’s land rights issues from 2011. Nur was a critical supporter of Pramila Bahini and carried out its work across the operational areas. She has been a leader in creating awareness among the fellow women in the community about their land rights, livelihood and their access to various government welfare schemes. 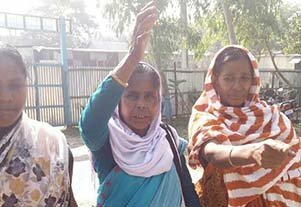 Gradually, Nur emerged as a vibrant leader of the community who not only supported Pramila Bahini by providing her able leadership but also helped expand their efforts to 72 villages in five blocks of Cooch Behar District. Nuri is now a known figure among the local administrative authorities, police stations and local land committee. She is a source of strength to many survivors of violence. Whenever she comes across any incident of violence or trafficking, she reaches out to the victims and supports them till they get justice. the entitlements of the poor. She fought a local Panchayat leader who was not providing work to women under NREGA. She took this matter to the highest official and brought jobs for the women in the locality and herself supervised the work. “As women we work on land rights because land is a secured asset, attached with social identity and dignity. Most importantly land provides security to women, reduces their vulnerability and protects them from different forms of violence,” says Nur. “Our struggle on land rights gives us recognition in our family and in our community,” she adds.